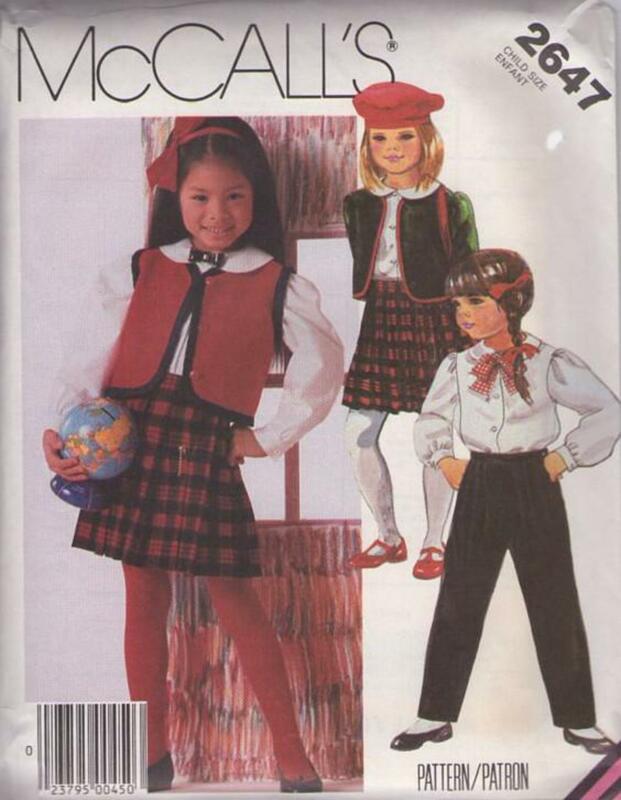 Bust 24", Waist 21.5", Hips 25"
1986, 80s Children, Retro School Clothing Patterns - CHILDREN'S JACKET, VEST, BLOUSE, BOW TIE, SKIRT AND PANTS: Lined jacket or vest has front buttoned opening and fold-over braid trim; jacket has long sleeves with gathered caps. Front buttoned blouse has Peter Pan collar, detachable contrast bow tie and long sleeves with gathered caps gathered into buttoned cuffs. Pleated wrap skirt is buttoned at waist and secured with purchased skirt pin. Tapered, pleated pants have side seam pockets with left side opening.